CT Tag for Schnegge's Scraps using a stunning kit she made that has a gorgeous feel of vintage to it. Soft vintage shades in rose pinks, beiges, and even a little bit of a black tone to it which combines to a very elegant feel with a little bit of vintage romance. The soft sounds of music flow in the background as the flicker of a candle glows in the distance as she waits for her love to arrive. 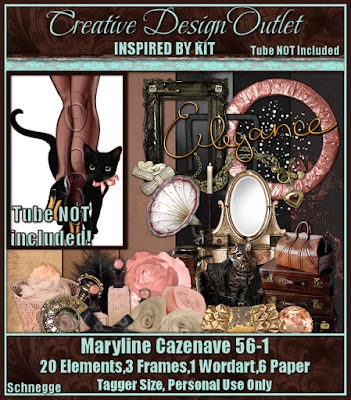 You can purchase this amazing kit exclusively here at CDO. With this kit, I decided to use the elegant art of Jennifer Janesko, whose tubes you can also purchase at CDO here.